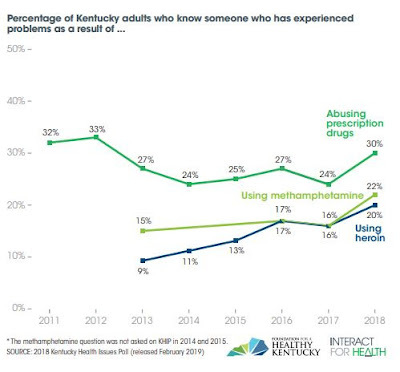 Overall, 31 percent reported drug abuse by friend or relative in the last year.Nearly a third of Kentucky adults reported having a family member or friend with a drug problem in the past 12 months, and just over half of those with problems got any sort of treatment, according to the latest Kentucky Health Issues Poll. The increase in knowledge of friends or relatives abusing prescription drugs was the largest annual increase ever seen in the eight years of the poll, which has been taken each fall. There was also a record rise in reported use of methamphetamine, which has been included in four polls. The increase in reported heroin use continued an upward trend that had slacked off in the 2017 poll. Reported use of prescription drugs, such as OxyContin, Percocet, Vicodin and codeine, increased to 30 percent from 24 percent; methamphetamine use increased to 22 percent from 16 percent; and heroin use increased to 20 percent from 16 percent. The polls margin of error is plus or minus 2.5 percent for each number. The poll found that of the 54 percent of friends and family members who got treatment, 36 percent entered treatment because others intervened, 18 percent entered treatment on their own, and 44 percent never entered treatment.